Published by Oxbow Books, Oxford (ISBN 978-1-905119-34-9), the book may be ordered direct from the publishers. This innovative study employs digitisation techniques and GIS technology to coax a wealth of important new information from an eighteenth-century map: William Faden’s survey of Norfolk, published in 1797. It sets the map, and its maker, firmly in their historical context. It also shows how, when combined with other datasets, interrogation of the various patterns and distributions which it shows can cast a shaft of new light on the development of the Norfolk landscape many centuries before the map was surveyed, as well as telling us a great deal about the contemporary, late eighteenth century landscape, and how it was understood, exploited and experienced. The book includes a digital version of the map on DVD. Andrew Macnair is a Research Fellow in the School of History, University of East Anglia and Tom Williamson is Professor of Landscape History at the University. 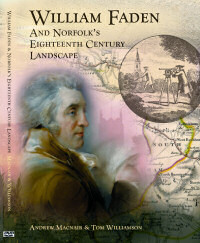 Winner of the 2011 EDP-Jarrold East Anglian Book Awards (history section).